FOR IMMEDIATE RELEASE: Bangor, Maine (September 9, 2018) – New England Fights (NEF) held its latest mixed-martial-arts event, “NEF 35: Wicked Season,” on Saturday night at Cross Insurance Center in Bangor. It was the third time in as many years that the fight promotion visited the Queen City and sold out the venue. The main event featured a bout hailed as the “Battle of Bangor” as popular locals Aaron “Relentless” Lacey (6-2) and Jon Lemke (7-9) squared off. Lacey submitted Lemke in the first round with a rear-naked choke. Hometown favorite “The” Ryan Sanders (17-9) took on Mando “Big Chino” Montoya (10-7) in the co-main event. At the 4:10 mark of the first round, Sanders, the reigning NEF Professional Lightweight Champion, forced Montoya to tap to a guillotine choke. It was a successful night for the Choi Institute of Portland, Maine as Caleb Hall (2-0) and Ernesto Ornelas (4-7) were both victorious via stoppages in their respective bouts. In the amateur headliner, Maine Amateur Wrestling Hall of Famer, 54-year-old Pat Kelly (4-1) put his lightweight title on the line against Massachusetts’ Ed Forlenza (3-2) in what Kelly vowed would be his final MMA fight. Forlenza was able to score a technical knockout via referee stoppage due to strikes to capture the title. After the fight, Kelly gave an impassioned speech, thanking his coaches at Young’s MMA in Bangor as the capacity crowd gave him a standing ovation. Nostos MMA also shined on the amateur portion of the card. The Somersworth, New Hampshire-based team went 2-0 as Zac Richard (2-0) and Andrew Brown (1-0) picked up wins under the guidance of Nostos head coach, and current UFC fighter, Devin Powell. NEF announced its return to Portland, scheduled to take place at Aura on Saturday, November 17. The event is titled “NEF 36: Battle for the Gold.” It will be the final NEF event of 2018. 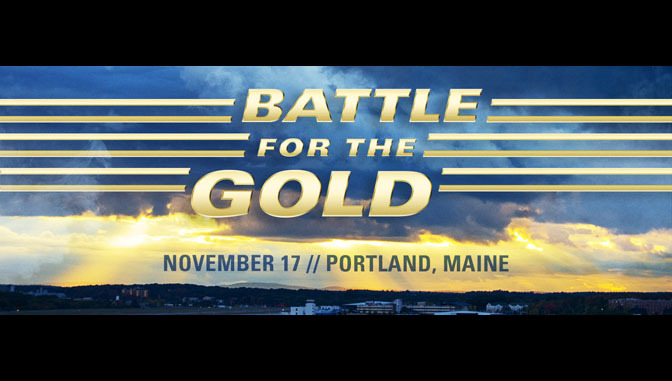 NEF’s next mixed-martial-arts event, “NEF 36: Battle for the Gold,” will see the company make its return to Aura in Portland, Maine. The event is scheduled to take place Saturday, November 17, 2018 with a bell time of 7 pm. The ticket pre-sale is happening now at www.AuraMaine.com with promo code “NEF.” Tickets will be on-sale to the general public on Monday, September 10 at 10:00 a.m. EDT.